The Fort Dodge Invitational is a premier meet each year with many of the best Iowa teams attending as a preview of the State course. It is often the first opportunity many teams have to compete against each other and to clock a quick time on a fast course. That's why it came as a shock and disappointment to many when the meet officials notified participating teams that the competition would be cancelled for October 4th. 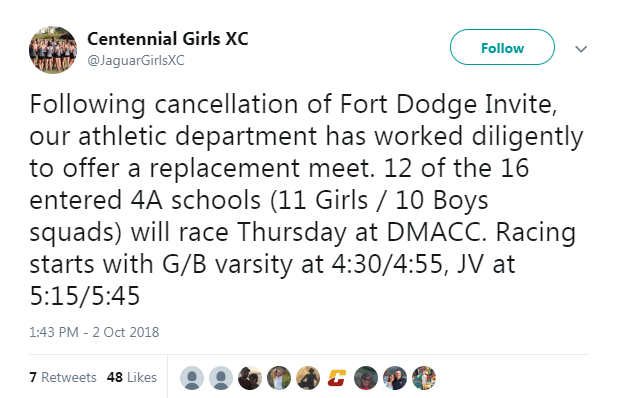 Officials from Fort Dodge High School claimed that the meet had to be cancelled due to poor course conditions. With the course being set on the beautiful Lakeside Golf Course, and this fall being an unseasonably wet year the meet officials could not take the risk of tearing up the course for golfers and runners alike. With the State meet just a few weeks away, the call was made to hopefully improve the course conditions prior to that day. With the inconvenience of the cancellation- one of many this season- teams had to scramble to find their way into other meets. A few teams, including Johnston and Dowling decided to attend the Des Moines North meet at Ewing Park on Thursday instead. Most teams, however, took up Ankeny Centennial's offer to host a meet at the DMACC campus on Thursday, the same course they hosted a meet on back in August. 12 of the 16 teams that were registered for the Fort Dodge Invitational have committed to running the meet at DMACC as a replacement, making it an exciting new event for Iowa teams! The competition will be exciting and should present a great alternative for those teams so looking forward to racing at Fort Dodge. Though nothing can replace the opportunity to compete on the State course, this meet is certainly going to a the premier event this week in replacement of that meet. Stay tuned for updates from these meets!